Photo of the day: ROOF COLLAPSE IN GREENWICH VILLAGE – Residents said it sounded like a car crash, next came the sound of fire engine sirens from everywhere. A row of four 125 year old buildings on a stretch of Bleecker Street between Grove and Barrow Street had the wooden and tin cornice suddenly come crashing down this afternoon around 2:30 pm. Luckily no one was seriously hurt. Firemen had to tear down the loose pieces and secure the rest of the cornice. As firemen inspected the roof it was now visibly obvious how rotted with age the wooden and tin cornice is. The firemen of ladder company 9/nine told me the roof is safe and secure, it is the cornice that will have the eliminated. Residents inside the buildings and stores were evacuated till the buildings can be declared as safe. The popular A.O.C. 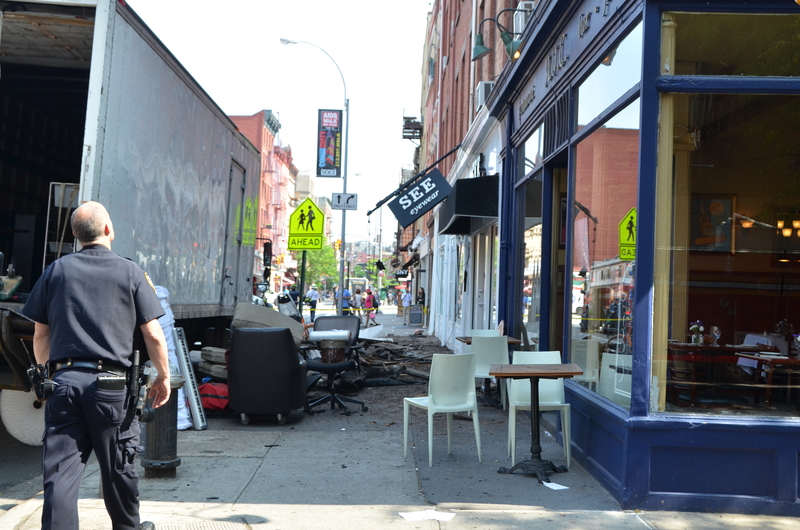 Restaurant at 314 Bleecker has also been affected by this. 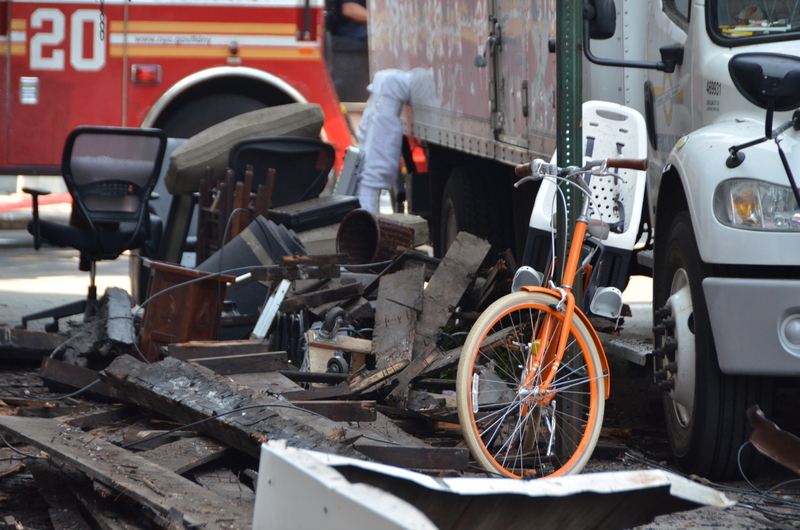 One of the residents of 312 Bleecker was a stunned expectant mother and her son who had to find a place to stay till they can safely return. Ironically one of the tenants was in the process of moving out, talk about omens! And speaking of omens….a gypsy fortune teller around the corner named ‘Clair Voyant’ oddly didn’t see it coming . . . This entry was posted on May 21, 2013 by newyorkcityinthewitofaneye. It was filed under Uncategorized and was tagged with 'Clair Voyant', 125 year old buildings, 312 Bleecker Street, 314 Bleecker Street, A.O.R. 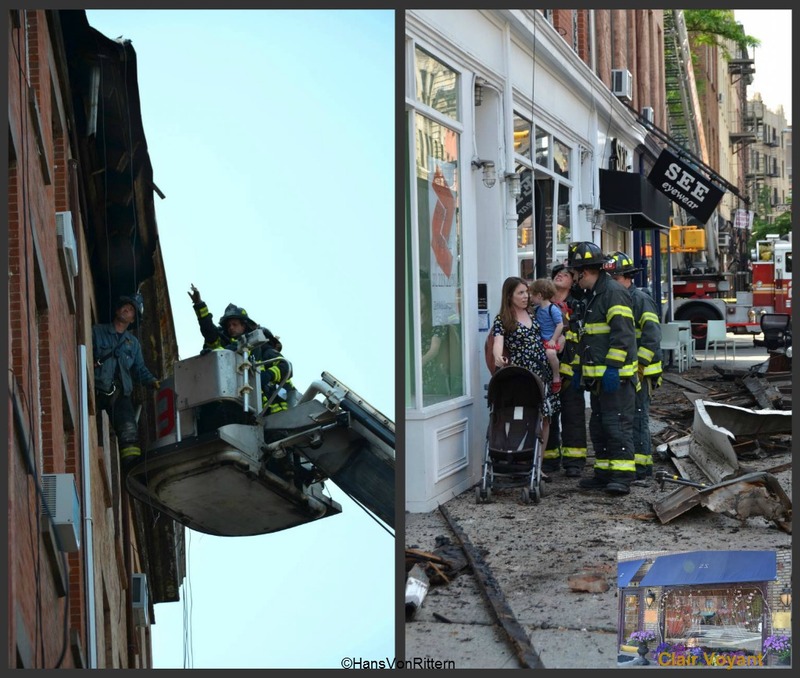 Restaurant, Barrow Street, Bleecker Street, firemen rescue, Greenwich Village, Grove Street, gypsy fortune teller, Hans Von Rittern, Ladder company nine 9, Manhattan, New York City, New York firemen, New York photo, roof collapse. Randi, the movers had just stepped inside the doorway as it crashed down, had it been seconds earlier, it could have been deadly. Clair might want to consider a name change. Glad no one was seriously hurt. Clair – perhaps to ‘Gyp Nosee’.